Beach canopy tents provide more shade for more people. When we first started our family trips to the beach there was just 5 of us. We now have 9 and one on the way. This means either bringing several large beach umbrellas, two pop up beach tents or a beach canopy tent where everyone can sit together. 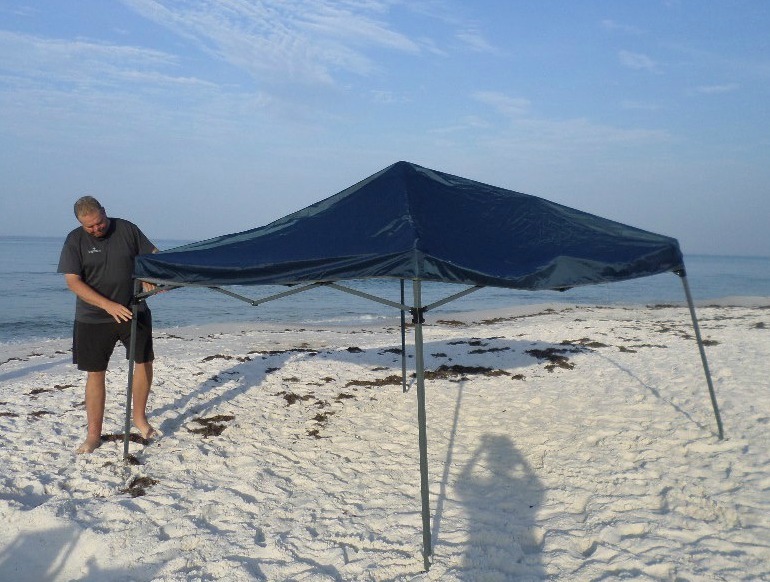 These beach shade tents comes in several different sizes and styles. We found that the 10'X10' canopy tent by Coleman gave us the shade and space we needed. Keep your chairs and coolers protected all day. Roof vents keep air moving inside the tent so the heat doesn't get trapped. Two people are best for putting the canopy up and taking it down. A practice set up at home helped to make it easier to put it up the first time at the beach. It really is quite easy and provided the perfect solution for all day shade for our family. A handy carrying bag with wheels fits inside most cars and makes it easy to transport. Add a "sun wall" to your canopy for extra protection from the heat and ultraviolet light. It also will protect you from the wind on a windy day or from a sudden rain shower. Loops are provided on the bottom of the shade so you can stake the fabric and keep it from flopping in the wind. Or you can put the elastic loops around the legs of the canopy for stability. We found it provided some great protection from the harsh summer Florida sun. No matter which beach canopy tent you use, keep the it stabilized in any wind by filling cheap shopping bags with sand and tie to the poles. This square canopy measures 13' by 13' and provides 169 square feet of shade. 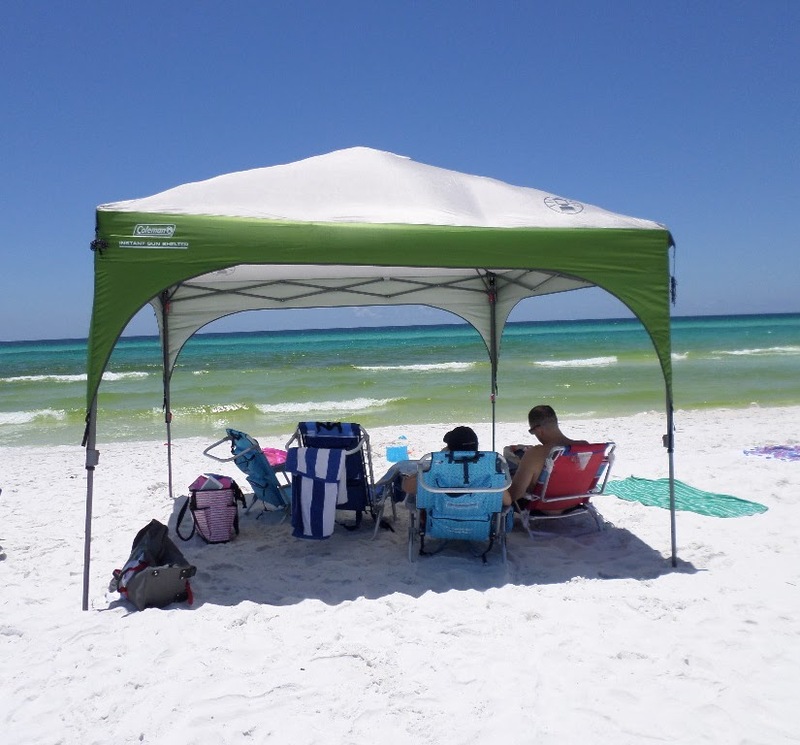 An upgraded version of the 10 by 10 Coleman beach canopy tent, this one offers a vented top that allows hot air to escape and to stabilize the canopy on a windy day so it doesn't blow away. The fabric is treated with UVGuard for extra protection from the sun. A beach shade tent is also helpful for when pop up showers come in - get out of the rain, stay dry, but still enjoy each others company. This tent weighs 48 lbs but is very compact and the storage bag comes with wheels. Quite easy to set up and take down but it helps to have more than one person for the job. Anchor the canopy with cords that come with it. A rust resistant steel frame makes this a study canopy that provides great shade and UV protection. It comes in two sizes 10 X 10 and 12 X 12. The 10x10 can accommodate 6-8 people plus some gear. Easy to put up with two people, yet one person with patience can do it by themselves. A rolling carrying bag makes it much easier to get to your favorite beach. There is lots to be said about having screens depending on the beach and the weather. When we go to the beach on the St. Croix River in Wisconsin, it comes with lots of flies and noseeums. This screened beach canopy keeps out the gnats, mosquitoes, bees and flies. You'll also find some protection from the wind and rain as well. It has two doors with zippers to keep them shut, a vaulted ceiling, and a heavy duty fabric that provides plenty of UV protection. For extra protection spray the fabric with Heavy Duty Water Repellent Spray so that when it rains no water will drip through. The hexagon shape can comfortably accommodate 4 adults and 4 children. Setting up is best with two people, and with some practice takes about 10". 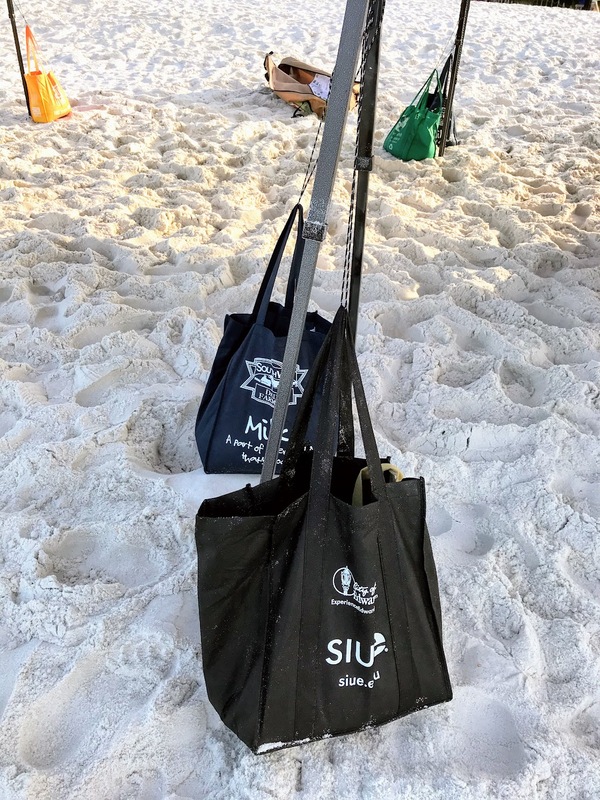 A carrying bag with wheels will makes it a breeze to bring it to your favorite beach. Providing beach sun shade to your group of friends or family offers some protection from UV light damage to skin, eyes and hair as well as protection from sudden pop up showers so you can enjoy a full day at the beach.